The Train Engineer transmitters command 5 Aristo ART-5474 Accessory panels to control the interlocking control system. Since the 5474 isn't configured to control a diode matrix directly, the small circuit boards at the right contain the signal conversion circuits. 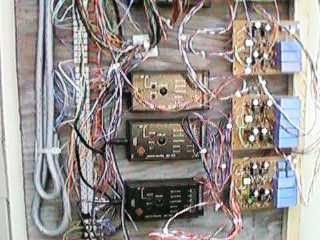 When the ART-5475 comes out, those somewhat complicated circuits could degenerate to a bunch of relays.